Dr. A.B. 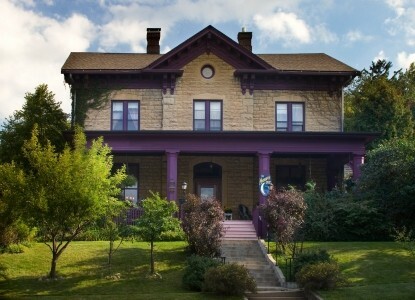 Hawley, who had practiced medicine in Red Wing, Minnesota for many years, built Moondance Inn in 1875. The main house has over seven thousand square feet of space and encompasses two city lots on a hill overlooking Red Wing, Minnesota. The house is made entirely of eighteen-inch thick limestone block quarried locally. The 40-foot wide front porch extends an open invitation to watch the town of Red Wing go by while you relax with wine and friends. This magnificent home is a 10-minute leisurely stroll to great antique shopping, fine restaurants, and the Mississippi River. There are numerous walking trails along the river and in the nearby hills. Some examples are Baypont Park and the trail on Barn Bluff. Downhill skiing, cross-country skiing, and golf are all within a 15-minute drive. 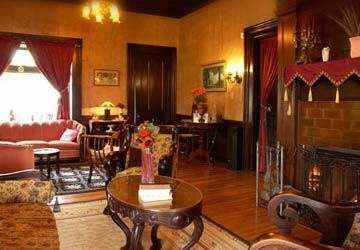 The entrance of Moondance Inn has 12-foot ceilings, fantastic chandeliers, and a sweeping staircase. The living room is the size of a small hotel lobby with hard wood floors of oak and walnut. A huge fireplace to keep you warm on a cold winter's night and walls that actually shimmer. The antique furnishings beautifully complement the room and are quite comfortable allowing for leisurely conversation or simply relaxing with a fine book. We are able to meet your needs from a quiet "get-away" to hosting your corporate event or reception. 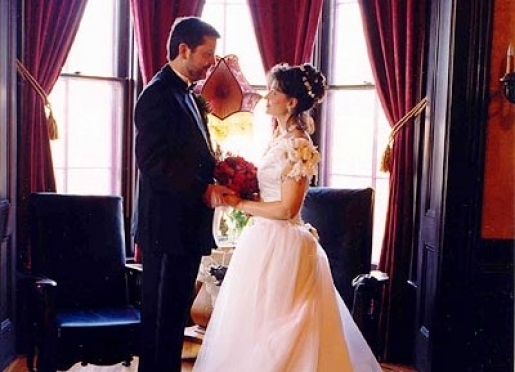 The Moondance Inn is an elegant retreat uniquely suited to create your perfect wedding. 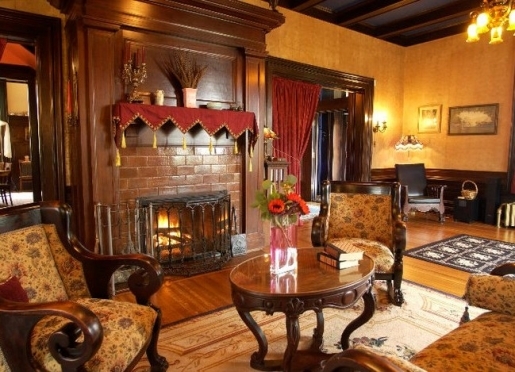 Red Wing Minnesota's Moondance Inn Bed and Breakfast is one of the most elegant sites in Minnesota to host your event. Perhaps a winter wedding in our great room under the Tiffany and Steuben chandaliers with a beautiful fire is your dream. 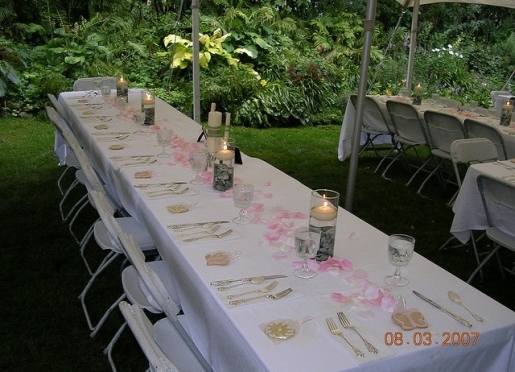 Or maybe an outdoor wedding surrounded by lush gardens is what you seek. Whatever your desire you can be assured of our full attention. We will provide a stress free experience that permits you to enjoy and remember all the wonderful moments. Respect, service, and attention to detail are all hallmarks of the Moondance Inn staff. For additional information please call (866) 388-8145 and ask for Mike. 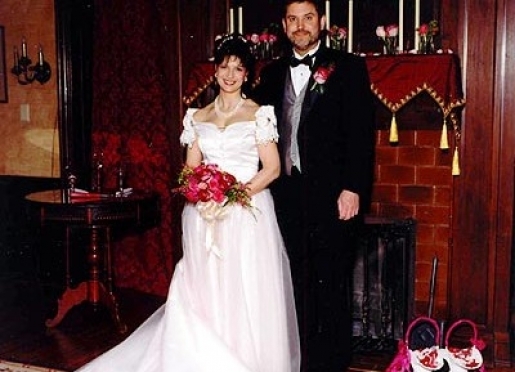 Our prices do away with hidden costs: $3,500.00 plus tax and $12 per person for June through October weddings. The Moondance Inn has a commercial kitchen that allows caters to prepare fresh meals on site. We have a list of local caterers or you may bring your own caterer. The catering service must be licensed by the State of Minnesota and we need a copy of their food handler's license. In some instances we can provide the catering services. You may provide your own beer, soft drinks, and hard alcohol. Purchasing of wine is through the Moondance Inn. You may choose your bartender. The Moondance Inn will provide coolers, tables, and glasses for your beverage service. For more information please call us at (866) 388-8145. 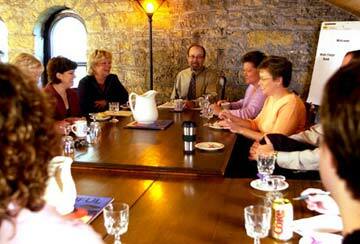 The entire 3rd floor was specifically created for business retreats or social functions. 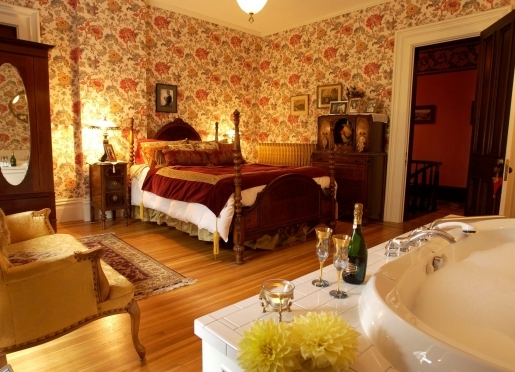 The Moondance Inn Bed and Breakfast Retreat Center is truly a great room. View the panorama of Red Wing, Minnesota bluff country as well as the Mississippi River Valley. You are standing in a 1,400 square foot room made entirely of limestone block and pine planking. 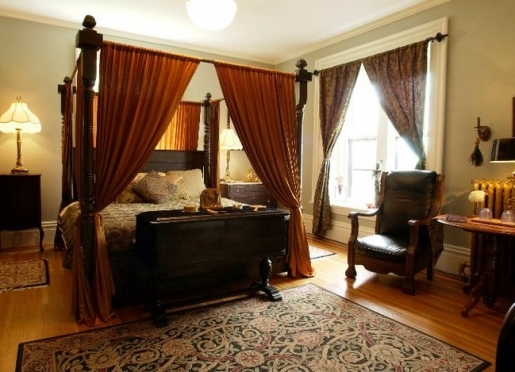 The Moondance Inn Bed and Breakfast was built like a castle with the stone being laid first then the heavy beams added second. 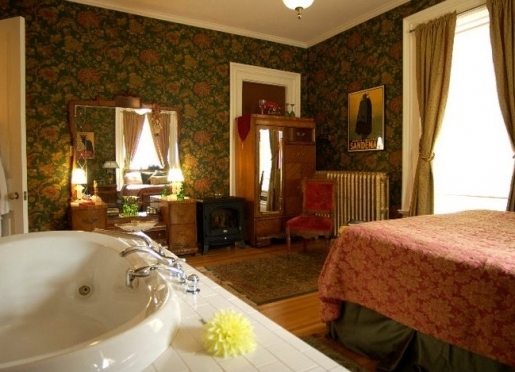 A rustic, magnificent room is an appropriate description of the Moondance Inn Bed and Breakfast Retreat Center. Conference tables are always set up. Modem lines and a large T.V. with VCR and DVD are also located here. Flip charts stand ready to be used. A rich 1890's fireplace mantel with a gas fire insert is warm and convenient to use and is a perfect spot for breakout meeting sessions or after the meeting wine and appetizers. The Moondance Inn Bed and Breakfast Retreat Center has been the location for numerous business sales, training, and planning meetings. It has been the site for scrapbook meetings, weddings, bridge parties, birthday parties, yoga retreats, self-help seminars, and so much more. 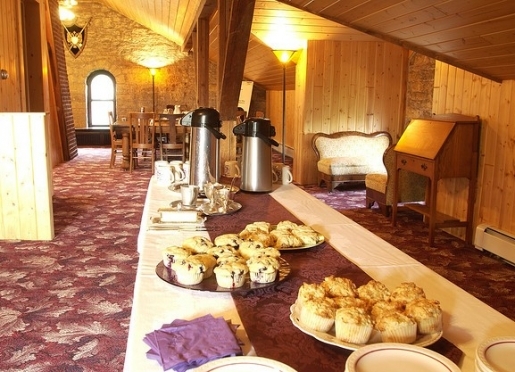 While the Retreat Center has all the modern amenities you will feel like you are in another era, a quiet era for there is little outside noise that penetrates the 18-inch thick limestone walls of this great room. A full day rental (8-hours) of the Moondance Inn Retreat Center is $150.00 plus tax and includes a morning coffee and pastry service as well as an afternoon refreshment service. A four-hour rental is $95.00 plus tax with the appropriate refreshment service included. 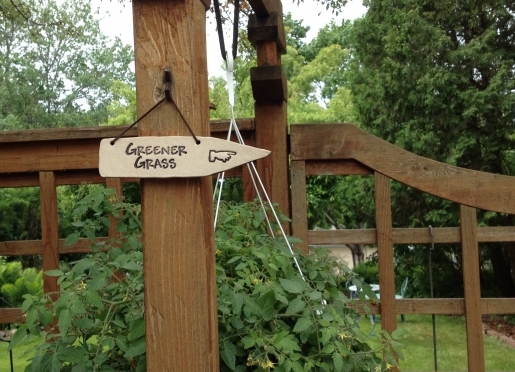 Additionally, the Moondance Inn Bed and Breakfast serves great lunches and dinners that you can reserve for your group. Overnight groups may also be eligible for guestroom discounts. Maximum capacity for the Retreat Center is 33 people.